Organize, wrap, and corral with packing bands that can help out with many jobs. This set of durable and stretchy silicone bands comes with two of each different size. The bands can be linked to work together, or secure one to itself—there’s no metal parts to cause any scratches or snags. 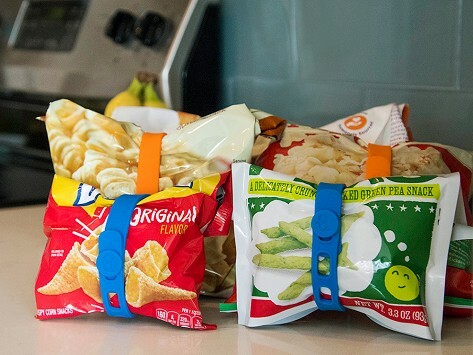 A band fits the bill for tasks like keeping clothes tidy in luggage (there’s even indicators for clean and dirty laundry), sealing open bags in the pantry and more. Includes six reusable silicone organization bands: two 9", two 12", and two 15"
These bands are thick enough, and the closure strong enough, that these work for all kinds of tasks. Highly recommend. Great for packing cloths for travel.